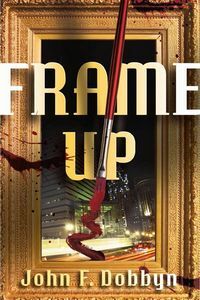 Frame-Up by John F. Dobbyn: Synopsis and Online Purchase Options. Synopsis (from the publisher): After graduating from Harvard Law with his closest friend John McKedrick, Michael Knight takes a job with his mentor, legendary trial attorney Lex Devlin, while John becomes sole associate of a notorious mob lawyer. Michael never lost hope that John McKedrick would escape to "cleaner pastures" — until John is murdered in a car bombing bearing the signature of his questionable clientele. How could two friends who were so close have taken such wildly divergent paths? In the wake of McKedrick's murder, three men who took their own deviating paths will meet for the first time in forty years. Matt Ryan, a priest, Dominic Santangelo, a mafia don, and Lex Devlin put the past aside to focus on a present concern: Dominic's son has been charged with John McKedrick's murder. At Lex's urging, Michael Knight reluctantly agrees to represent the alleged bomber. In building a defense, Michael is drawn into a high-stakes art fraud that leads him from the seediest parts of Boston to the sophisticated Amsterdam inner sanctum of international crime.